Mac was born 16 November 1919 in Chesterton, New York. He received a Batchelor of Arts Degree at Union College, Schenectady, New York in 1942 and later a Masters od Divinity from Yale University. He died peacefully in his sleep, 7 June 2008. He was Ordained in the Methodist Church by Bishop Francis McConnell of the Troy, New York Conference, as a Deacon in May 1944 and as an Elder in May, 1945. He served as a Director of Religous Education in New Haven, Connecticut from 1942-45, and as Pastor of the Roubd Lake United Methodist Church from 1949-50. Mac married Ruth Evelyn Smith in 1941. Ruth, a fantastic Navy wife, walked through life, both in and out of the Navy, with him. Mac and Ruth have four children. 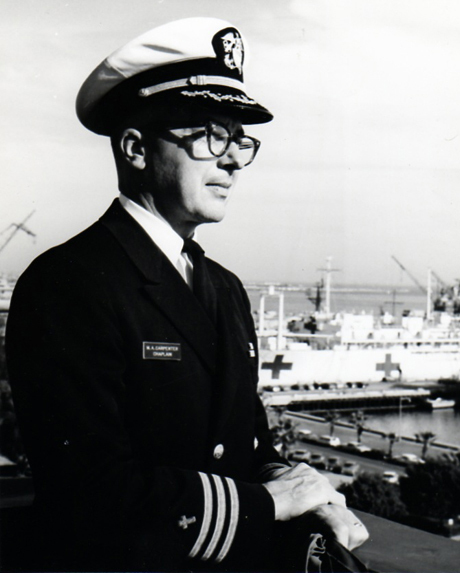 In May, 1945, Mac was commissioned as a LT(jg) in the U.S. Navy Chaplain Corps. He attended Chaplain School in Williamsburg, Virginia from May to August, 1945. Photo left: Cdr. Carpenter in Long Beach. 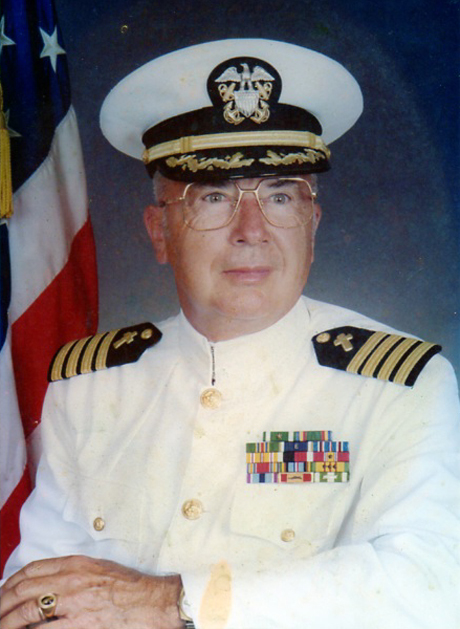 Mac retired from the Navy on 1 August 1980, as Gray Shepherd of the Navy. This special title, which he held for two years, signifies that he was the most senior, in time of service, of all Navy chaplains on active duty. His personal awards and medals included: Military Unit Citation, Navy Unit Citation, Navy Commendation Medal w/ Gold Star and Meritorious Service Medal. After retiring from the Navy, he stayed active in local church and community affairs, and embarked on a second career as a chaplain aboard the Princess cruise ships. Editor's Note: Details and photographs for this story were graciously provided by the Capt's son, Christopher Carpenter mail.